Arriving early in St. Petersburg is always a treat. You can spend your extra time sightseeing, shopping or just relaxing. Dan, Tom and Lina had an intensive schedule; they went to Pushkin, a town outside St Petersburg that had been occupied by the Nazi's throughout the Siege 1941 - 1944. They visited Catherine the Great and Alexander Palace which has been restored, the building and grounds are beautiful now. 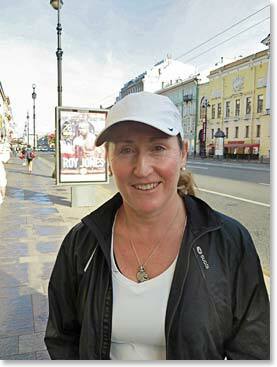 Micheline arrived ahead of schedule as well and her plans were to relax and get ready for the XXV International Marathon "ERGO White Nights". She has also just arrived from our Berg Adventures Bolivia program where she took our Mountaineering Course. Lazlo arrived a day early in St Petersburg and he went immediately sightseeing with Inga, our tour guide, who was waiting for him at the airport. 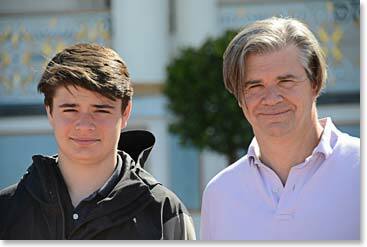 Together they visited Victory Square, Crusier Aurora and Finland Station. 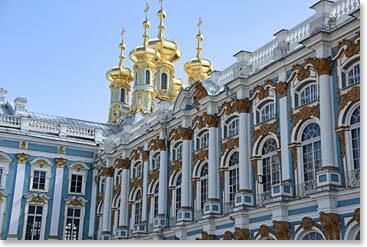 The Catherine Palace built by Catherine the Great in 1717. 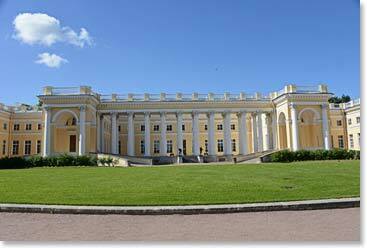 The Palace is located in Pushkin (Tsarskoye Selo) 25 km southeast of St. Petersburg, Russia. It was the summer residence of the Russian tsars. The Alexander Palace was the former imperial residence, known as the favourite of the last Russian Emperor, Nicholas II, and his family and their initial place of imprisonment after the revolution that overthrew the Romanov dynasty in early 1917. Although the Alexander Palace survived Nazi occupation, the decision was taken after the war to turn it into a naval college, and the museum's collection was disbursed among the other Imperial palaces. Since Perestroika, however, the museum was reopened, and an ongoing project to recreate the interiors as they were in the reign of the Nicholas II. 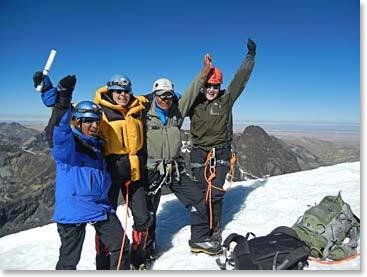 Micheline with her climbing team on the summit of Pequeno Alpamayo in Bolivia a few weeks ago – she has been busy! Lazlo arrived in Saint Petersburg and didn’t waste a second. 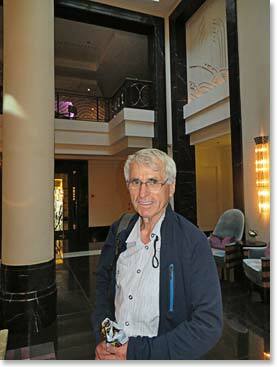 Together with his tour guide, he went sightseeing - barely stopping at the hotel. 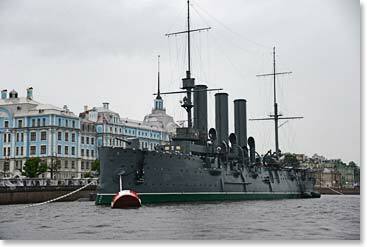 The historical ship Aurora, currently a museum, took an active part in the Russo-Japanese War of 1904-05 and the Tsusima battle. At 9.45 p.m on 25 October 1917 a blank shot from her signaled the start of the assault on the Winter Palace, which was the beginning of the October Revolution.